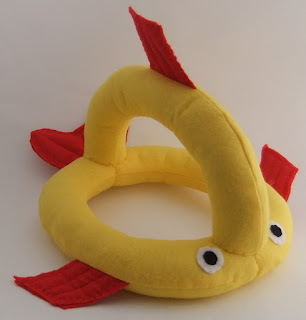 My first chickenfish is now undergoing roadtesting by two kittens belonging to my son and his fiancee and seems to be bearing up well, so I'm ready to share my pattern with you. As I've made it in honour of FosterDadJohn and his kittencam, I'd like to ask you to only make it for personal use unless you make a donation to purrfectpals, the charity that John fosters for. 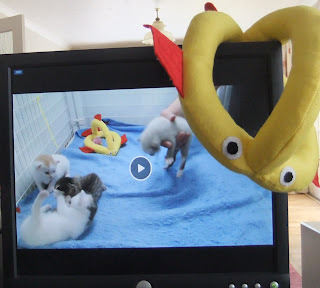 If you are wondering what I'm talking about, it's time you watched the kittencam! You'll need yellow felt for the body, red felt for the fins and tail, optional wadding to pad the fins and tail, black and white felt for the eyes, and toy filling. I used a carrier bag full. 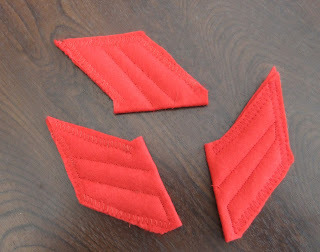 I used straight and zigzag machine stitching and handsewed some parts. My felt was supplied by MinervaCrafts.com (thank you!) and you can read all about my struggles designing the pattern here and here. Details of materials used are at the bottom of the page. Clicking on each picture will enlarge it. I've added measurements to help you to duplicate my efforts, but to be honest it isn't rocket science and your versions may well be better than mine! Additional details of how to sew your chickenfish are in my previous post here. Fin: Make three the same. 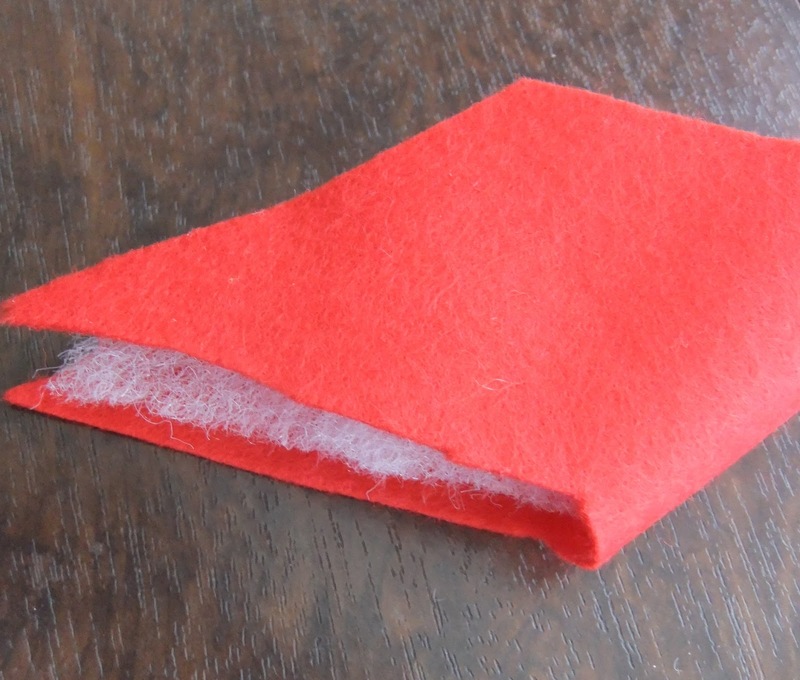 Fold each fin piece in half, sandwiching wadding between if you wish. Zigzag stitch around edges, add (optional) top stitched details. 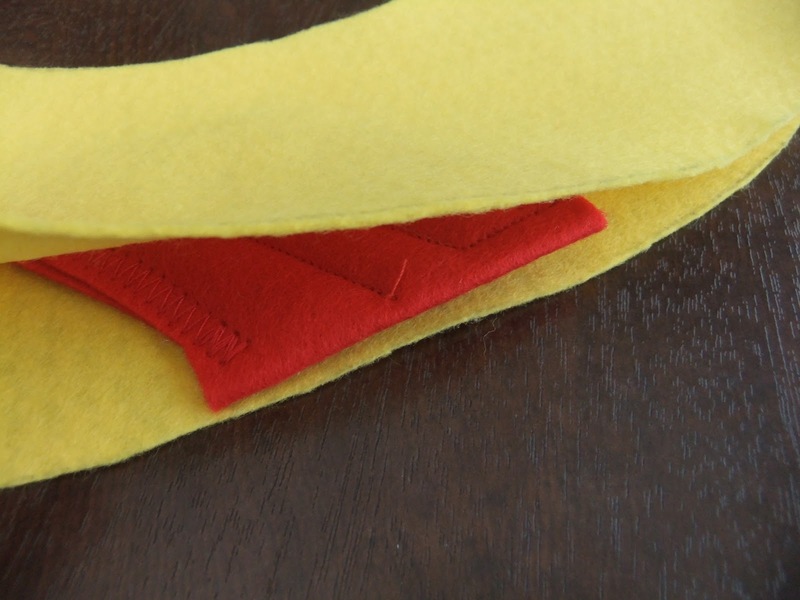 The folded edge will be sewn inside the body seam later. 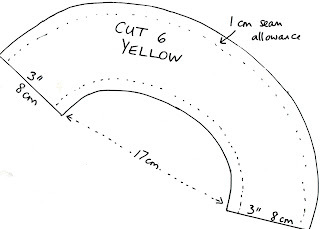 Main body: Cut 6 "rainbow" shapes in yellow. Position and pin top fin halfway along outer edge of one body piece pointing down, then add the second body piece on top so that it will be inside when you sew the seam. That makes more sense in the pictures below. Sew outer and inner seams. 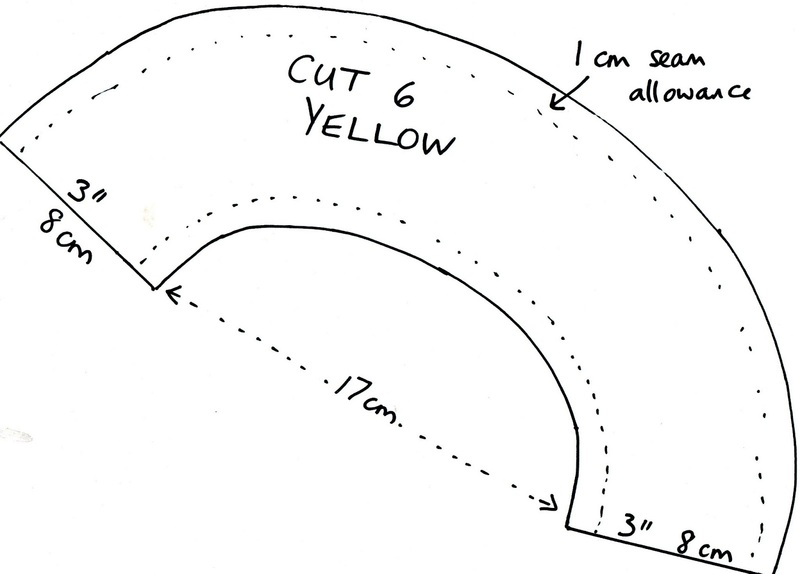 I've allowed one centimetre (half an inch) as seam allowance. The next photo show the body section turned the right way out, seam inside. Stuff with toy filling from each end. You *might* find sewing the tail on easier if you don't stuff yet, but it'll be very tricky stuffing the whole thing from just one open end. Judgement call! Pin chickenfish's rear ends together, folding a 1cm (half an inch) seam allowance at both ends and handstitch securely. Very securely! Kittenproof! 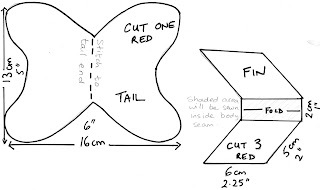 Tail: Place tail in position, matching the centre of the tail to the seam and handstitch securely. Now add wadding (if used) and pin sides of tail together. Zigzag stitch as with fins, topstitch details (optional). 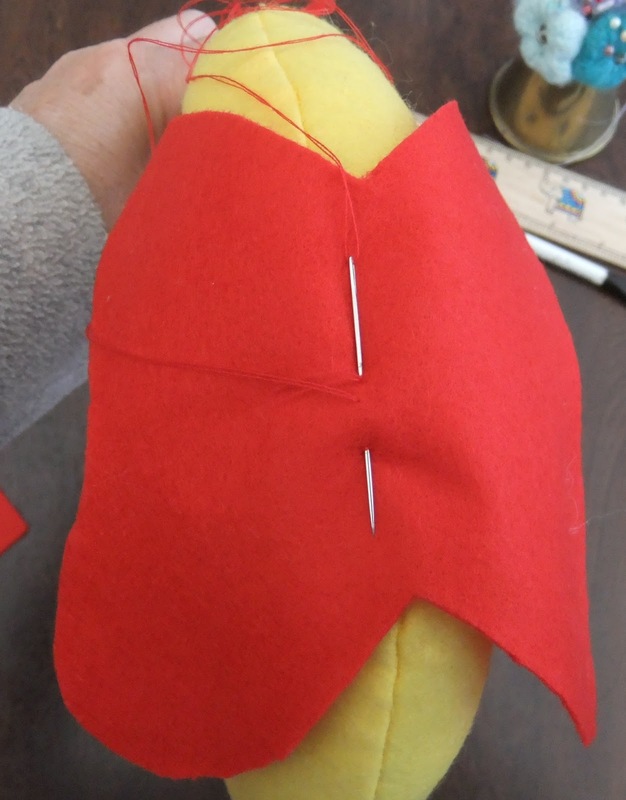 You will probably need to finish by handsewing as the stuffing will prevent the machine getting up close! 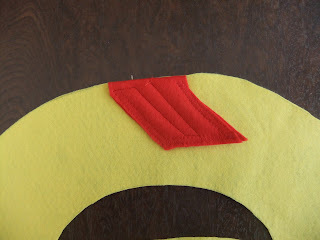 Join front ends in same way, then position and pin top section and stitch in place. 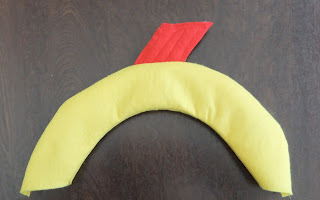 Take care to line up seams, it helps give chickenfish a face. Eyes: Cut two white circles to size (mine are 1" across because that was the size of the nearest round thing!) and two smaller black circles. Stitch together, then in position. 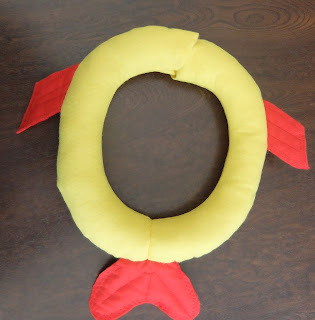 You are welcome to use this pattern free of charge for your own kitties, but if you choose to sell your chickenfish please make a donation to help support FosterDadJohn and all the others who help PurrfectPals. I'm not a professional pattern writer (can you tell?) so if this fails to make sense, please let me know and I'll correct it. 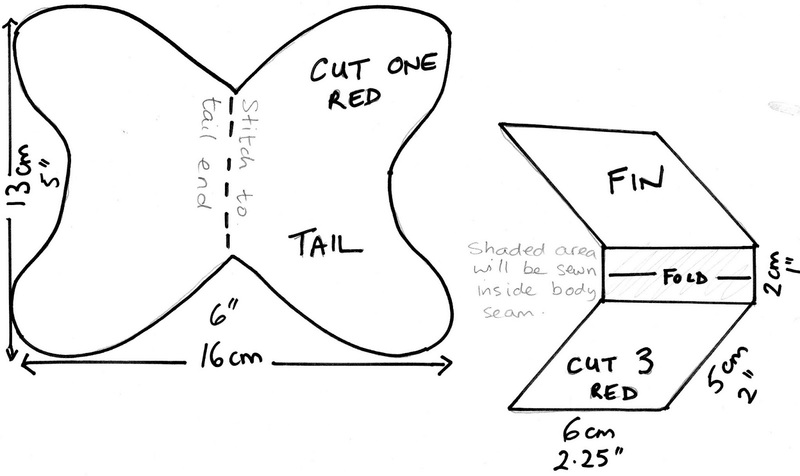 You can find more detailed sewing information in my previous post here. The wadding came from my stash but I think Minerva's lightest weight wadding would be fine. Black and white felt also came from my stash, as did the toy filling. I used a carrier bag full, I don't know what weight of bag that would be, best to check before ordering! Minerva have filling and eyes if you prefer to use them. You are filling a huge need, created by FosterDadJohn and his kittens. Thank you. Wow! Thank you so much. I was going to try to do the same thing but just haven't seem to have the time. Again, Thanks! You are most welcome - hail! I hope you don't mind but I posted the link to your pattern on The Critter Room on facebook. 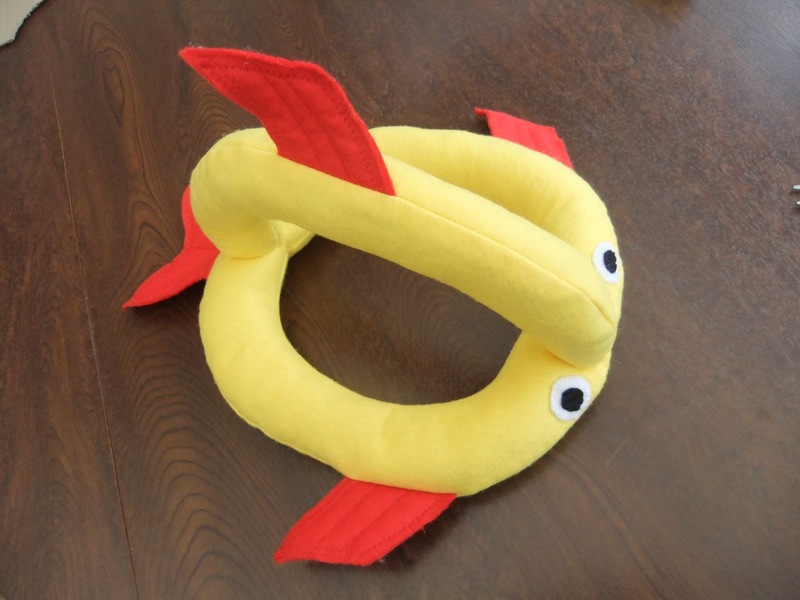 A few people on kitten cam chat had been looking for a chickenfish pattern, and I had found yours and decided to share. Thanks for the wonderful pattern. That's absolutely fine - all I ask is that if you use my pattern to sell, please donate to purrfectpals like I do. Thank you!! 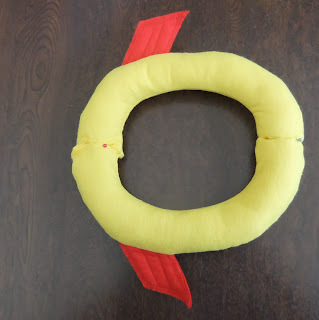 These will be fun for our kit-tens! Thank you for sharing. I may see if I can make some for the local no-kill shelter/fosters. This could be a fun project! Enjoy, Kat! Don't hesitate to get in touch if my pattern is unclear. 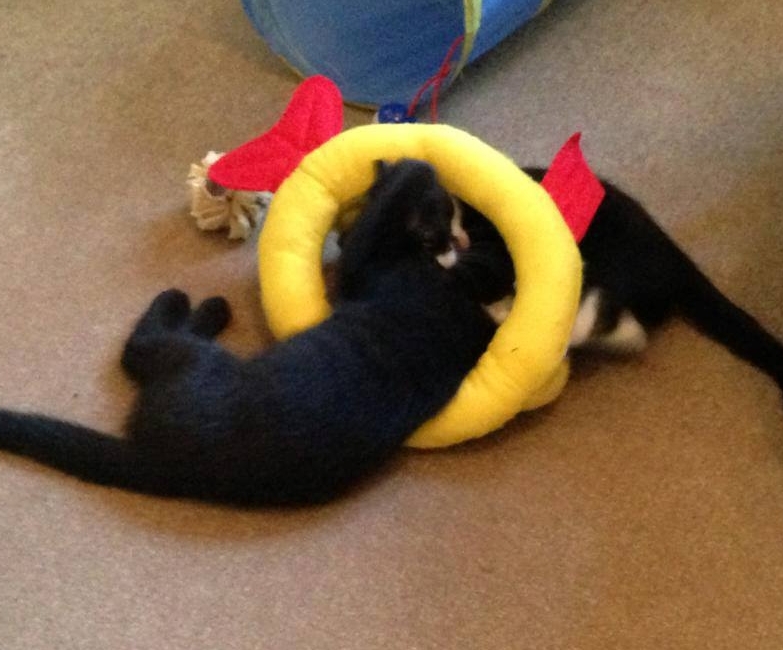 The one I made for my son's kittens is still being played with, it's "bobbled" up a lot, but is still loved.